Push-ups are another one of those things I’ve always hated. Possibly it’s because push-ups are a popular form of punishment in the Army, especially during training. If I had a dollar for every time I’ve heard “FRONTLEANINGRESTPOSITION…GO!” I’d probably own a nicer car. The official term was “supplemental PT (physical training).” The unofficial was “getting smoked,” as in your working so hard, there’s smoke coming out of your ears. “Make the walls sweat” was also a term I heard often. Of course, there were other activities involved in these smoking sessions like the overhead-arm-clap (doesn’t sound bad, until you’ve been doing it for an hour), the cockroach (painful and embarrassing), front-back-go (my least favorite EVER), the low crawl (most effective when you’re doing it across 50 feet of sand or clay), or forward lunges for a 1/2 mile with your rifle over your head. But I digress. Sorry! I don’t get to tell my training stories very often anymore. One of these days, I’m going to dig my old letters out and blog them. I wrote my family every day, so I did record much of what was happening. It’s probably not true to say I HATE push-ups. I like the long, lean, and toned look they give my arms when I’ve been doing them regularly. I’m just not a fan of actually doing them. Last night I came across an iPhone app called “The PushUps Coach.” I currently have the free version downloaded. The app is designed to go from being able to do just 6 push-ups consecutively to 100 in a row. That sounds good to me! The most push-ups I’ve ever been able to do in a row (real, Army-standard push-ups) without stopping was 30 in two minutes. Doesn’t sound like a lot, but it was a great improvement for me. When I started Army basic training, I couldn’t even do 1 “real” push-up. I have the muscle memory now, and I know what good form feels like, so even though I’m out of shape…I feel like I’m ahead of the game compared to a few years ago. Today I did Week 1, Day 1. That was 5 sets: 6 push-ups, 6 push-ups, 5 push-ups, 4 push-ups, and 5 push-ups. It was pretty easy, especially since there are timed cool downs in between each set. I’m going to look into a custom plan and see if I should make my own, because I do feel that this is easy. I mentioned above that the best I’ve ever been able to do was 30 consecutive push-ups. Well, I only got to that point by doing one handed assisted push-up sets throughout the day for several weeks. I think to see the improvement I want, I can’t just do this once a day. I realize that the plan will get harder over time, but I think it’d be more effective if I was doing it a few times a day, when possible. So I’ll have to tweak the custom plans, and see what I come up with! How many push-ups can you do? Do you like doing them? Know of any great push-up apps? 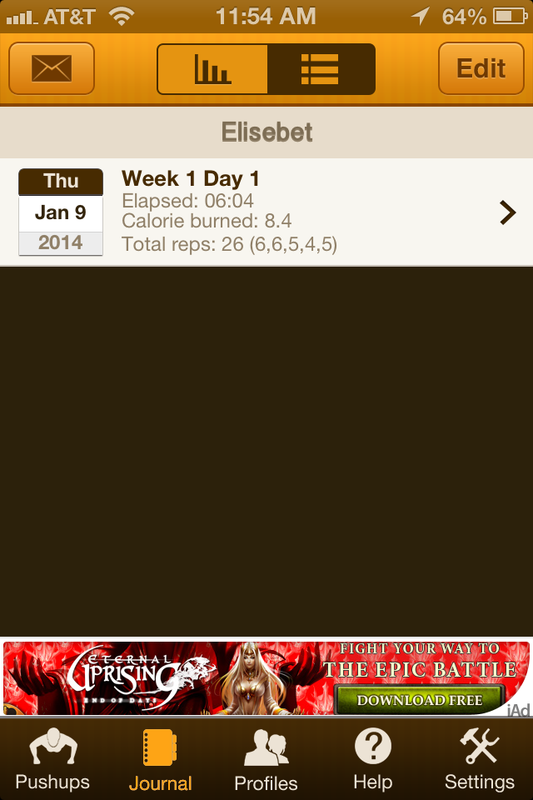 This entry was posted in Strength Training and tagged apps, arms, iPhone, muscle, Push-ups on January 9, 2014 by Elisebet.